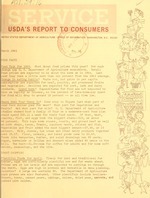 USDA'S REPORT OIT 4 SUMMERS ,,. March 1965 : .16 "
rear they rose lirrle more than one percent from the 1963 average. for food will drop to around 18 percent -- an all time low. fruits? And what part for milk? U. S. Department of Agriculture ..
as pork chops, bacon, franks, luncheon meats, chicken and fish. cost ';5.57. Flour, cereals, and baked goods came to $3.43. Easter, eggs are particularly plentiful now and for weeks ahead. the month. Eggs are high in protein and versatile in menu planning. Service under a Quality Control Program. Under the program eggs must be: 1. Gathered frequently, 2. Cooled on the farm immediately after gathering, 3.
supermarket your "food bill," take another look at that adding machine tape. content of major B vitamins. food and other agricultural products to the right places at the right time. of the products you want when you go to the supermarket. now beginning to find flavor in the U. S.
the time the leather is tanned and gets to the factory the cost is $1.50. add $2 for salesmen and $2.45 for overhead and profit. The price to you--$9.95. Office of Information, U. S. Department of Agriculture, Washington, D. C., 20250.
with experimental animals show that overeating shortens their lifespan, the U. S.
studies concerning the relationship of diet to body functions and the length of life. in survival are found. Heredity also is a factor. the chemical repellent deett," developed in Department of Agriculture research. temperature were more attractive to mosquitoes. a costly livestock disease that can be transmitted to humans as undulant fever. reported, or about 1 case for each half-million population. to locate sites for homes, schools, shopping centers, airports and industry. Agriculture. Gross earnings of 744 working homemakers averaged almost $2,900. out of ten of the wives in the study pooled their income with their husband's. of Gainfully Employed Wives in Ohio, Home Economics Research Report No. 27." talk, write to: Editor, SERVICE.